…you seem to have forgotten your petticoat. Er, and pants, for that matter. Going on a flying fox in your wedding dress seems completely nuts anyway (yikes, imagine flashing your wedding night undies at your wedding guests, AND catching your gown in the wheel and leaving half of your skirt behind… classy), but going on a flying fox closely followed by your heavier groom without considering the laws of gravity is just… well, take a look. I started off feeling slightly disapproving before watching this video (people treating vows lightly, yadayada), but – tres funny and sweet. This is one of those pictures where I can’t help laughing at this poor woman’s face, even though she’s obviously terrified, in an ‘oh no, this is going to end badly’ kind of way. On the other hand, the groom is finding it waay too funny. And this animated gif had me shooting tea out my nose (too charming I know). 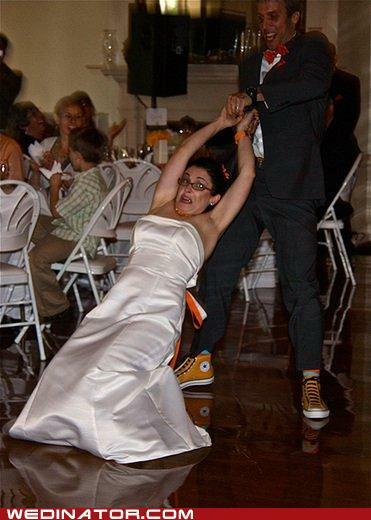 You’ve probably seen this before, but it made me giggle, so take a peek – the Best Wedding Dance Ever, apparently!